SHIPROCK, N.M. -- This Navajo Nation town of 8,000 people -- named for the towering rock formation that looms in the distance -- is a living monument to uranium mining's deadly legacy. At the end of Uranium Boulevard here is a 100-acre waste dump overseen by the U.S. Department of Energy. This former uranium mill -- which helped build the atomic bombs that ended World War II and fueled the United States in its arms race against the Soviet Union -- has dealt the Navajo homeland, or Dinétah, a particularly hard blow. Navajo mine workers and others on the reservation have suffered high rates of disease linked to contamination. The Shiprock rock formation near Shiprock, N.M. Photos by Manuel Quinones. "That legacy that we relied on has had a big burden on this nation, the Navajo Nation," U.S. EPA Regional Administrator Jared Blumenfeld told a conference last month in Farmington, N.M., that focused on uranium cleanups. Despite an ongoing five-year plan to coordinate cleanup efforts among federal and tribal agencies, one high-priority site is now clean and more than 500 polluted mine sites remain. In northeast New Mexico, the Navajo tribe must grapple with dirty water, contaminated land and even radioactive homes, some of which were built with uranium mining waste. "It's an untold story," said Blumenfeld, who leads the Region 9 office in San Francisco. "The biggest hurdle is the sheer number of sites. We're diligently going down our list." Miners extracted almost 4 million tons of uranium ore from Navajo lands between 1944 and 1986, EPA says. While military demand for uranium for bomb manufacturing shrank by the 1960s, nuclear power plants quickly picked up the slack. In 1971, the federal government allowed uranium to be sold on the open market for the first time. "We need to put our heads together and get rid of those holes that are still open," Navajo Nation President Ben Shelly told the cleanup conference. "We need to do that right away." EPA, which has been helping coordinate the five-year plan, is moving forward with cleaning up the largest abandoned uranium mine on the Dinétah. Decontaminating the Northeast Church Rock Mine will require the removal of 1.4 million tons of dirty soil, an effort expected to take several years. 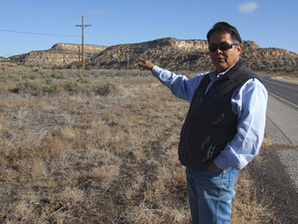 "This is where the milling took place, right here," said Navajo anti-uranium activist Larry King, as he stood beside an isolated highway in Church Rock, a town of about 1,000 people near Gallup, N.M.
Anti-mining activist Larry King, near former and potential uranium mining sites. King, a former uranium miner, talks about the 1979 waste spill from the United Nuclear Corp. site that polluted Rio Puerco -- the largest release of radioactive waste in U.S. history. The spill happened just a few minutes' drive from King's home. There, in a rugged landscape with stunning rock formations, one can see hills made from mining waste. "Just to warn you," King said, "there are high readings in this area." General Electric Co., United Nuclear's parent company, has tentatively agreed to pay $44 million for the Northeast Church Rock Mine cleanup. "There are others that we have not found yet," EPA's Blumenfeld said. "The polluters should pay. The polluter pay principle is something that is going to have to come to the fore here." In her book "Yellow Dirt," journalist Judy Pasternak, perhaps the most well-known chronicler of the Navajo fight with uranium mining pollution, describes how companies walked away from mining operations and left liability behind. With the United States desperate for uranium to build atomic weapons to compete with the Soviet Union during the Cold War, she wrote, executives and government officials -- including regulators at the former Atomic Energy Commission -- paid little attention to environmental damage and radiation exposure. Navajo President Shelley said a joke here goes like this: "Don't turn the light off, we'll glow in the dark." 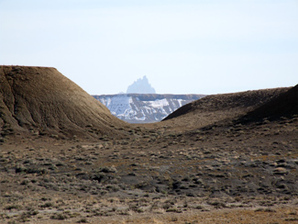 In 1978 Congress passed the Uranium Mill Tailings Radiation Control Act to give DOE authority over uranium mill waste sites like the Shiprock facility. The 1980 Superfund law and the Interior Department mine-reclamation program helped address some sites. And in 1990, lawmakers created a program to compensate people affected by radiation at mines and from nuclear weapons tests. But it wasn't until 2007 that tribal and federal agencies got together to really tackle the lasting problems of uranium mining on the Navajo Nation. Pasternak's articles in the Los Angeles Times prompted Rep. Henry Waxman (D-Calif.), then chairman of the House Oversight Committee, to press for immediate action. "We're on track to make all the commitments we made in the five year plan," Clancy Tenley, EPA's regional tribal coordinator, told the cleanup conference. Tenley was among several federal and tribal leaders touting the achievements of the last several years. EPA and tribal authorities say they have inspected more than 600 homes and other buildings for uranium contamination. The agency has already torn down 34 of those structures. Displaced Navajo families are eligible for financial compensation and temporary housing. EPA says it has participated in rebuilding 17 residences. Federal and tribal leaders admit that evicting people can be traumatic. But they say they try to make up for it by making sure Navajos get construction jobs and following traditions. Homes, for example, must face east. "They are so happy," Darryl Jimson, planner with the Navajo Nation Community Housing and Infrastructure Department, said of the people given new homes. "Some of them cry." It has taken decades for the Navajo to learn about the risk of living on contaminated land. In the 1970s, workers were using the Shiprock dump to practice with heavy machinery. And to this day, it is hard to convince tribal residents to not drink contaminated water. 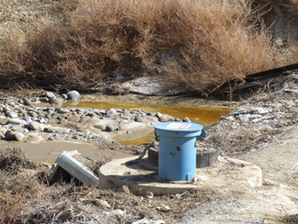 Potentially contaminated water near DOE's Shiprock waste site. Many elderly Navajo don't speak English and have grown used to living off their land. "They just don't understand or they don't believe it," said Chris Mike, an officer with the Navajo Department of Water Resources. "It's a tough sell." Thirty percent of Navajo residents do not have treated water, and numerous water sources have been deemed too dangerous to drink. One alternative is to truck water to thousands of people around the reservation. Residents meet the trucks at designated locations because many homes are too remote. "We are 60, almost 70 years into this legacy," Chris Shuey, uranium program director at the Albuquerque-based Southwest Research and Information Center, said in an interview. "And we have left it to the children and the grandchildren of the original miners. And we are going to end up leaving it to our children and our grandchildren." Not only does Shuey lament the time it has taken the federal government to realize the severity of the problem, he is also upset that officials do not yet know the full scope of the health problems the Navajo people face. Researchers next year will begin a federally funded study to determine the impact uranium waste has on pregnancy. "We've essentially just started the human health studies in the last 10 years," Shuey said. "We're 30 years behind." And there is a long way to go. Cleaning up all the contaminated sites will likely take decades. Federal and tribal agency leaders have already began talking about another five-year plan. "A lot of community people get exhausted and deflated," Shuey said. At the same time, they want to fight until the Navajo Nation is clean: "They're hoping that it's the next 10- to 20-year plan." The current cleanup framework has turned decades of haphazard response into a coordinated effort. Still, it is not hard to spot fissures. Many Navajo, for example, say DOE should be playing a larger role -- and spending more money -- in the cleanup effort. "There's a major gap in the response because they don't have the authority to deal with mines," Shuey said. "And they're right now the biggest problem." Stephen Etsitty, executive director of the Navajo Nation EPA, which has dozens of workers participating in the cleanup, has called on DOE to close the Shiprock site and move waste off the reservation. Tribal leaders say waste is seeping off the dump. But that proposal is expensive and complicated. It is being resisted by the government. U.S. EPA cleanup efforts in Church Rock, N.M.
"People would be swearing," a Navajo Nation EPA official said at a cleanup-conference session, referring to how non-American Indians would react if the government handled a cleanup in their community as they have here. "You treat tribes and other communities off the Nation differently. For me that's unacceptable." The Shiprock disposal cell is bordered by 77 acres of a large-rock barrier called riprap. The site is on a terrace overlooking the floodplain of the San Juan River, a major tributary of the Colorado River. Water from the site seeps into Many Devils Wash nearby. Experts cannot say whether the puddle of reddish-brown water is contaminated, but DOE officials concede they worry about pollutants like manganese, selenium and, of course, uranium. "We are trying to trace back the sources of those seeps," said David Schafer, team leader and manager at DOE's Office of Legacy Management. "The groundwater at Shiprock is a very, very important issue for us." Federal and tribal officials say they take pains to consult with the Navajo people, but that is not a simple task. The Navajo Nation sprawls over more than 24,000 square miles, an area larger than some states. "We have concerns and we should be the ones to have an input. We are the ones living there," Bess Tsosie of Mariano Lake, N.M., said in an interview. 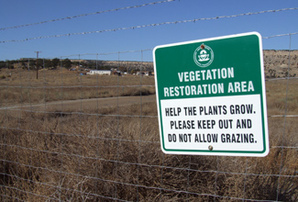 "It's our land that's impacted. It's our health, our animals, our plants." Tsosie leads a community group in her area, one of several that have sprung up to give residents a voice. "It's not for us," she said. "It's for our children and our grandchildren." Amid anger and a host of unresolved issues, companies are moving forward with plans to mine for uranium again near the reservation. Navajo President Shelly said executives are reaching out to him with what has become a taboo subject -- new mining inside the Navajo Nation. Shelly stressed the tribe's uranium mining ban, "The Navajo Nation set a mandate, a no-uranium mandate." But, he acknowledged, the pressure won't easily go away. "The Navajo Nation," he said, "is sitting on the finest uranium there is."